On January 11, 2004 the collar from #217F began transmitting a mortality signal. Later that day (?) her bloody carcass was located at the bottom of a granite cliff near Buffalo Fork. The remainder of her pack, the Slough Creek pack were found feeding at an elk carcass above her. No. 217F was a dispersal from the Druid Peak pack, who dispersed about a year ago and mated with #261M, a dispersal from the Mollie’s pack and formed the new Slough Creek pack. Speculation was that during the kill, 217F slipped, or was pushed by the elk or another wolf and fell from the cliff. However when researchers skied into the site to retrieve the carcass they discovered large pools of blood and injuries inconsistent with a fall or being kicked by an elk. Researchers also discovered numerous wolf tracks at the scene, probably from her own pack since no other wolf packs had been observed near the area. 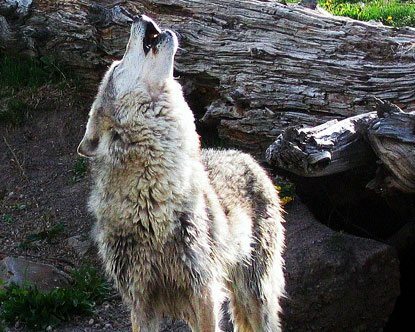 Park ranger and researcher, Rick McIntyre and others had observed prior to her death some indications that she had lost her status to an uncollared black female in the pack. Intrapack killing is uncommon, and the only other known instance of wolves killing a member of their own pack was with the Druid Peak pack and the death of alpha #40F.